The 2018-19 season will feature celebrations all over the world commemorating the 100th birthday of Leonard Bernstein. It also marks the 75th anniversary when a young conductor stepped onto the podium in front of the venerable New York Philharmonic in a sold-out Carnegie Hall. It was 1943: the United States was at war, patriotism was high and the time was ripe for America to receive her first native musical hero with open arms. With millions of people across the country listening on the radio, Leonard Bernstein gave the downbeat and blazed into that role. And the rest, as they say, is history. During this anniversary year, a retrospective re-examination of Bernstein’ s innumerable artistic accomplishments is inevitable. And certainly, one of the questions that will be asked is “What was his greatest accomplishment?” Was Bernstein’s highest achievement as composer, conductor or educator? Consider all those television lectures in which he taught music to a whole generation, or those revolutionary, sophisticated Broadway scores that set a high standard still unmet by a large percent of today’s musical theater composers. Think about all the hundreds of young musicians he helped or the many social causes to which he tirelessly devoted himself. What exactly was Leonard Bernstein’s greatest accomplishment? I was one of those young musicians who Bernstein inspired and taught. In March of 1985, I was in New York to perform at Alice Tully Hall. Lenny invited me over to his Dakota apartment for a drink afterwards. It was our first meeting. I told him of my great interest in studying his own works with him. At the time, it seemed to the Maestro that young conductors were more interested in studying Mahler, Beethoven and Stravinsky with him rather than Bernstein. He was touched that I wanted to concentrate on his own music. So on that evening, Lenny opened up a bottle of scotch and together we opened up the score of his Jeremiah Symphony. The two of us sat talking into the wee hours of the morning about, well, everything. I often thought of that first evening in his beautiful studio in his apartment. It was the perfect setting for a well-known insomniac like Lenny to work long into the night: the rich deep colors of the dark brown carpet and red curtains framing the wooden shutters around the windows, those brass lamps illuminating floor-to-ceiling shelves of music, the magnificent fireplace by the door, the elegant, round glass-and gold cocktail table, that beautiful painting over the sofa and that big oak table which was his desk on which he studied his scores. The studio had a cozy feeling, although the space was quite large. At one point, while we were discussing composing and his own music, he pulled out a large hand-painted Japanese pot from under the piano that was full of pencil stubs. “I throw all my used pencils into this pot. Some of these pencils go all the way back to West Side Story and Kaddish“, he told me. I love listening to and performing Bernstein’s music. Yes, there is his sophisticated harmonic language, the “melodic concatenation”, the ingenious combining of tonal and atonal elements and the use of jazz. There is a total naturalness to his music, a sheer emotional quality that speaks to the heart; pieces of endearing lightness and mournful heaviness, joyful praise and lonely laments, great tenderness and hard conflict, the brightest of sunrises and the darkest of nightmares. In short, the entire complicated and thorny range of human emotions. Bernstein traversed them all and took us with him on a most breathtaking kind of journey. 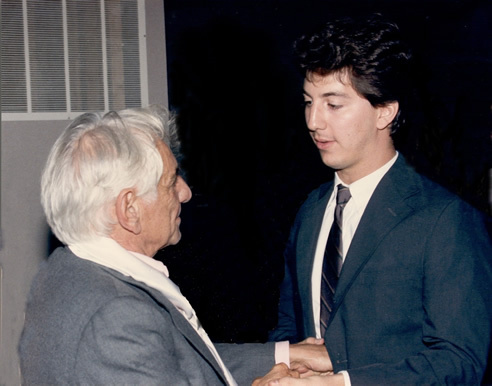 Bernstein’s desire to share every experience and feeling with others was an important aspect of his character that was encountered by anyone who came into contact with him or his music. It was not unintentional that he wrote on the first page of his piano work, Touches, “Touches = gestures of love, especially between composer and performer, performer and listener…” For me, this was Lenny’s artistic creed. I’ve always felt that a great accomplishment is something to which one commits his whole heart and soul for the betterment and benefit of others. Lenny committed his entire being to everything he did, whether conducting a Mahler symphony, teaching at Tanglewood or Schleswig-Holstein (and don’t forget his beloved Harvard), composing Jeremiah, Age of Anxiety, Kaddish, Mass or Candide, raising money for Amnesty International or giving quality time to inspire and talk to a young musician. In this sense, all of Leonard Bernstein’s achievements were his greatest accomplishment.